Last night I took my 12-year-old son to see Buckethead at Freebird Live in Jacksonville Beach. In the past year all three of my sons have developed an appreciation for, and I hope I'm using the term properly here, people who can shred an axe. They acquired this taste by spending most of their waking hours and some REM sleep playing Guitar Hero. To give you an idea of how out of place I was at this event, the last musician I saw perform live was Janet Jackson at the MGM Grand in Vegas back in 1994. Yes, I'm a part of the Rhythm Nation. When I mentioned that I had attended this concert to my son and his teen-aged friend and nephew on the drive up, they didn't know enough about her to be mortified. For those not yet familiar with Buckethead, he's a former guitarist for Guns N' Roses who plays his own instrumental guitar songs, most of which are thundering heavy metal riffs played at such a ferocious pace they're perfect for masochistic pattern-recognition videogames. I first discovered this performer when his song Jordan was played around 1,000 times in my house as an unlockable bonus track on Guitar Hero II. 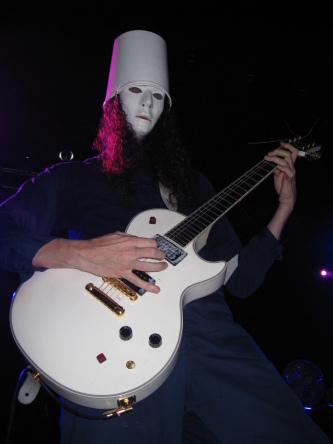 But you really don't know Buckethead until you've seen Buckethead. He played Wednesday wearing his usual attire -- a bucket on his head, expressionless Michael Myers mask, one-piece work dungarees and Converse All-Stars. Last night he wore a plain white sandpail instead of what we were expecting, a KFC bucket scrawled with the word "Funeral." Although I read somewhere that his outfit's a consequence of shyness, the presentation makes him look like someone who has killed and will kill again. I'd never been to Freebird Live, a concert venue owned by Judy Van Zant-Jenness, the widow of Lynyrd Skynrd founder Ronnie Van Zant. The place holds around 700 people, who can either watch downstairs or from a balcony that overhangs the stage. We watched upstairs from a perch close enough to drop a cameraphone on Buckethead, because I know that if I ever enter a mosh pit I will fall and break a hip. Apparently there's a protocol for moshing at Freebird that allows it at some performances but not others. Early in Buckethead's set, a guy in his early twenties began banging around, clearing out a widening circle between himself and a bunch of unhappy people who held up the universal hand gesture for "step off." When a bald guy finally showed up and reciprocated his desire to become human pinballs, they had just gotten started when giant security guards wrapped them up and dragged them off. This was probably for the best. When only two people are moshing, they look like the preliminary rutting ritual of adolescent male elk. I would not be surprised to learn they're now dating. Considering the location, I was shocked and disappointed that nobody yelled "Freebird". I'm afraid of liking a band for fear it will ruin them for my kids, but Buckethead rocked. We didn't bail until after he played "Jordan" around midnight, and I can still hear the song in my tinnitis. The bass was so loud downstairs I was afraid it might alter the electrical impulses of my heart. I went to bed twitching like Jeff Goldblum in The Fly. Credit: The photo from last night's concert was taken by Anders Lindquist and is used with permission. Sounds lke a helluva a concert, I would love to see Buckethead live. But I would bring some earplugs. I first became a Buckethead fan nearly 20 years ago when one of the guitar mags I used to subscribe to had a track of his included on an insert (which I think might actually have been a plastic record!). I thought he'd disappeared for awhile until he turned up in GNR and he earned even more cred for getting kicked out of GNR for being too crazy. Thank God for the Guitar Hero and Rock Band video games -- a whole new generation of kids are being exposed to great, great music! Buckethead never disappeared - far from it. He's done a ton of playing in various outfits with Bill Laswell (Praxis), John Zorn and Les Claypool over the years. I was at that show also. He played for like another hour after jordan. I hope you and your sons got to see him cover the star wars theme and the foxy lady cover. Towards the end of the show the opener (that one guy) came out and they both played. Yo Buckethead has always been so lit for every single show I've been to. So happy for you guys that you were able to go!